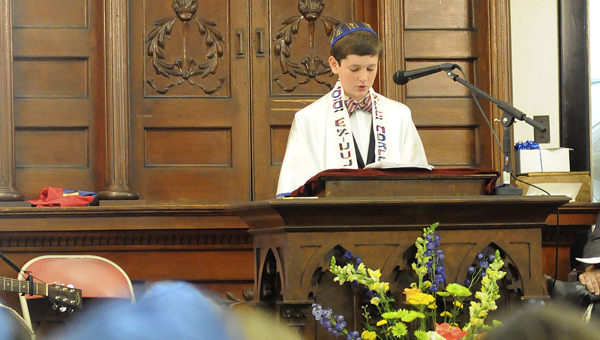 Elijah Schulman was called to the Torah on August 3, 2013 at Temple Mishkan Israel in Selma, Alabama. You are a delightful young man! Mishkan Israel is important to even the non-Jews here in Selma...High Holy Days services often find more Episcopalians, Roman Catholics and other Christieans attending than Jews!!!! St Paul's. my parish, has a long-standing relationship with the congregation there, having shared our facilities for services before the Synagogue was built. I will be on-hand for your Bar Mitzvah if I can make it and I am very pleased that you have decided to share that important time of your life with us in Selma. Mazel Tov!!! I am now a grandmother of nine, but when was in 5th grade a school assignment introduced me to genealogy and for the past 57 years I have researched my ancestry and helped others to do so. You are an inspiration and I hope that someday I will get to meet you. I am also President of the Jewish Genealogy Society of Greater Washington and I have posted the link to your website on our FB page. Stand tall on your special day - you are truly a mensch! I hope you have a good time, best wishes from London, England. Elijah, I read your story on Tablet Magazine and am so impressed with you. I have made a contribution to the efforts to save this historic synagogue. Best of luck with your bar mitzvah next month! I grew up in Selma and had my Bar Mitzvah there in 1989. While I am one of the Children that moved away, Selma and the Temple will always have a very special place in my life. The building contains many, many memories of Friday Night Services, Saturdays during the Holidays, late nights at Passover and of course my Bar Mitzvah and my Brothers Bar Mitzvah. Your project is a great one and it is my pleasure to donate to such a great cause.